Cabinets were not part of our house when we moved in. The kitchen was deemed finished with a black granite counter-top with open spaces to incorporate cabinets. As converting the yawning spaces in the kitchen, work area (scullery), store room (pantry), space under stairs, and the bedroom closets obviously involves a significant outlay of time and money; we weighed our options before deciding on a contractor. MDF (Medium Density Fiberboard) bring up the rear. 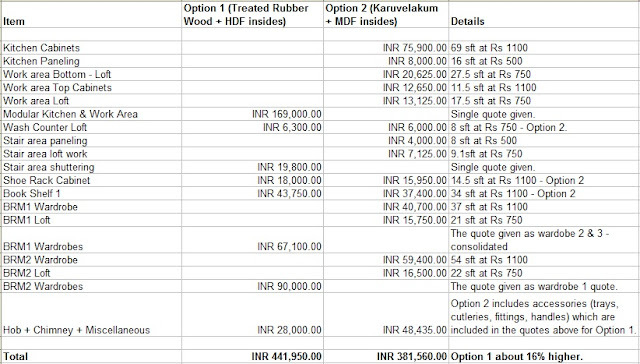 Teak is 30% more expensive than rubwood which in turn is 15% pricier than HDF. There is a huge difference in quality between HDF and MDF – from the cutouts, it was obvious that any premium for HDF is well worth it. Our preference was to have the exterior in a second tier wood type and the skeleton in HDF. Roughly 90% of the work is done at their ‘factory’ with the remainder 10% at your home site: The cabinets come ready for assembling and installed. This is the most expensive option. But, if executed well, it is the best option for getting cabinetry work done while living in the house. Around 50% of the work is done on-site: Usually such contractors have a workshop but still a bulk of the assembling/polishing is done onsite. Similar to the first option, a couple of carpenters at the minimum will be around for quite some time. Pricing wise, they tend to be expensive but often well worth the premium. This is the preferred alternative for those who are not in a hurry to move into the house. The entire carpentry work involved is done on-site: These contractors invariably provide the biggest bang for the buck since they don’t have to maintain a carpentry workshop. As small-time dealers, their organizational skills leave a lot to be desired. The real damper is the carpenters being regulars at one’s abode until the work is over. We decided to go with rubwood. The estimated 6-7 days of work inside the house with that option (Option 1 in spreadsheet above) compared to 6-7 weeks bowled us over despite its higher pricing. In reality we were pulled in hook, line, and sinker by the perfect sales pitch of the contractor - two of his workers were regulars at our house for 6-7 weeks. The shell upon which to install the cabinet doors were framed inside our house, although the pieces came measured to spec. Once the shell was in place, it was quick work to install the cabinet doors which came fully done. Words fail to capture the frustrating work ethic of the carpenters – on a good day, they would show up around 10AM, take a half-an-hour tea break almost immediately, work for almost two hours, take an extended lunch break that lasted till around 2PM, followed with another two hours of work – some days, they came just for two hours. The project dragged on for more than three months although the two carpenters gave attendance for only 6-7 weeks – many days were ‘no show’ days for reasons best known only to them. Dealing with the contractor was another nightmare. He rattled us proper by attempting to pass HDF doors in place of rubwood doors citing aesthetic appeal. We were promised verbally that all exposed pieces will be done in hardwood (rubwood) as opposed to HDF and that only the inside shell will be done in HDF. We did relent a bit on this and agreed for some exposed sides also to be made of HDF but not the doors. The contractor offered different upgrades verbally at various times but unfortunately his expertise lay only in managing cabinetry work: e.g., we took him up on his offer to put up a chimney hob and gas burner but he did a lousy job at a high rate. Also, he passed on several MDF panels as HDF panels - it was too late by the time we detected it. Overall, the finished product that we have at home looks respectable. But, working with the contractor and the carpenters was indeed testing. Should we have to do this again, we would seriously consider taking a hands-off approach and have the builder do it for us, even if it involves a premium.